It may not have the profile of the IIMs as yet, but it ranks #4 in BT’s B-school survey. And it’s not an interloper; it has been ranked among the best Indian B-schools for several years now. Three thousand feet above sea level, in Lavale taluka on the outskirts of Pune (which is about 800 ft above sea level), the winds of change are blowing through the 30-year-old Symbiosis Institute of Business Management (SIBM). Spread over 300 acres on a picturesque hilltop, the Symbiosis Knowledge Village, SIBM’s new residential campus, has become operational from the current academic session. The students, numbering a little over 400, have already checked in, but finishing touches are still being given to the auditorium, lecture rooms, library and recreational centre. But no one is complaining about the “work in progress”. Some new students even feel that “studying here is like holidaying in Khandala, Ooty or Mussorie”. Arun Mudbidri, Director, SIBM, is justifiably proud of the new picture postcard campus. “A residential campus was the big missing link in our portfolio,” he says, adding that he now plans to take the institute “to the next level in terms of infrastructure, faculty and programmes”. That’s shorthand for a concerted effort “to challenge the supremacy of IIMs”. SIBM is getting there. It ranks #4 in the 6th BT-Nielsen Survey of India’s best B-schools, the third successive year that it has held on to that position—ahead of the entire universe of Indian B-schools covered by this survey barring the Big 3 IIMs (A, B and C). SIBM, in fact, is already threatening these IIMs on some key parameters. According to the BTNielsen Survey, functional heads, HR heads and young executives rate SIBM at par with, and, in one or two cases, even above IIM-A, IIM-B and IIM-C in areas like teaching methodology, quality of placements, infrastructure and specialist units. Mudbidri is now focussing on building greater corporate linkages— both on course content and in the sphere of attracting professionals from the corporate sector to teach at the institute. “It is (and will remain) a win-win situation for both sides. We’ll assist the corporate sector to grow and, this, in turn, will help us grow,” he says. 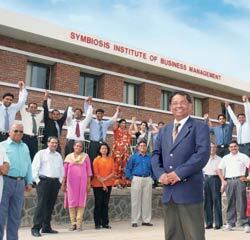 The school has established itself as one among the best B-schools in India.